Harvest: When only a few inches tall, or thin the plants to one foot apart and grow full-sized plants. Technique: By hand, selecting the young, tender leaves and shoots. If growing as a cut and come again crop, harvest with scissors as needed. Cooking: Should be cooked only briefly, as it gets mushy. Stir-fry or add it to soup. Harvest: When they are about one foot tall. Cooking: Blanch and serve with cooked mushrooms or seafood. Harvest: Leaves can be harvested at about 10–12 inches tall. Technique: Break or cut off the outside leaves at the base of the plant or cut the entire plants back to 2 inches. Cooking: Commonly used in stir-fries and soups. Harvest: While they are young and still firm, in white or green stage. They grow bitter as they mature. Technique: Harvest regularly and do not let them ripen on the vine; they will continue to ripen after harvesting. Cooking: Fry quickly or incorporated into simple egg dishes. Leaves and shoots are edible while they are young. Use salt to reduce bitterness. Harvest: When leaves are young and tender. Technique: Cut leaf at base. Cooking: Leaves taste bitter, can be used in soups with pork. Vine is not edible. Technique: Harvest the flowering stalks just before the buds start to open. Cut the stalks at the lowest node where there is a new leaf to force new side growth. Cooking: Stir-fry is the most popular way to prepare it. Putting it into cold water right after blanching will retain nice green color. Harvest: Individual stems or whole head. Technique: Cut stems when they are about 10 inches high; new stalks will continue to form. Or harvest the whole head by cutting the plant off at the ground with a sharp knife. Cooking: Stronger in flavor than American celery,. Use in many Asian soups and stews or stir-fried with squid. Harvest: Can be harvested as soon as the tops grow to 6 inches. Technique: Cut leaves about 2 inches above the ground, or blanch by completely excluding light to produce yellow tender leaves and stalks. Cooking: Taste like garlic, can be used as filling in dumplings with ground meat. Widely used in Chinese medicine. Harvest: When they are only about 6 inches high and leaves are tender. Technique: Young leaves can be pinched off as needed. Dig the roots before the plant goes to seed. Cooking: It's among the most important flavorings in many Asian dishes. Roots can be cooked and eaten as a vegetable, chopped leaves are sprinkled to flavor dishes, and seeds are used to season curries and rice dishes. Harvest: When they are young and firm but filled out at about thumb size. Technique: Harvesting regularly keeps your plants producing new fruits. If left too long on the vine, they will become seedy and bitter. Cooking: Sliced cucumber can be stir-fried with pork, mixed with vinegar to make a cold dish, or pickled. Harvest: Ready when it is full colored but has not yet begun to lose any of its sheen. Technique: Press down on the eggplant with your finger. If the flesh presses in and bounces back, it's ripe. Cooking: With tender skin and little bitterness, there is no need to peel or salt. Can be fried and served in a spicy sauce. Harvest: At about 6 inches long. Technique: Harvest fruits often, in their immature stage. Cooking: Peel and cook much as you would squash. Harvest: When they are young and tender about 1.5 inches in diameter. Also young leaves. Technique: Cut an inch or two below the soil surface. Young leaves can be cut for greens. Cooking: Peel the skin from these "bulbs" (actually swollen stems). Slice and use in stir-fry, steamed, or boil in chicken broth. Can be used raw in a salad. Harvest: When they are 2–3 feet tall. Technique: Harvest the white leafstalks by cutting them at the base of the plant once it's established. Cooking: Chop and use them to flavor chicken or fish stock-based soups, with or without coconut milk. Can also be used in salad dressings and to make a fragrant cup of tea. Harvest: When they are still immature. Fruits feel firm at about 6 inches long. Technique: Cut fruits from the vine. They are edible only when immature. Left too long on the vine, they will toughen into a sponge. Cooking: Peel and cook in soup or with meat. Flower buds, young shoots, and leaves can be added to stir-fry. Harvest: A few leaves at a time as needed. Thin to one foot apart. Technique: For red mustard, the younger the leaf the milder; for green mustard, harvest mature heads as you would cabbage. Leaves can be harvested over a long time. Cooking: Strong flavored mustards are blanched and served with oil or oyster sauce, stir-fried with meat and bean sauce, or can be cut and pickled. Harvest: Start harvesting when they are about 2–3 feet tall. Technique: Cut the leaves and stems as needed. Cooking: Commonly used in stir-fries and soups with meat and seasonings. Harvest: As soon as the plant is established. Technique: Both green and purple varieties grow in the same manner as basil. Pinch leaves as needed. Cooking: Use purple perilla for flavoring seafood and in pickling. Green leaves are made into tempuras or wrapped around sushi. Harvest: Pick immature pods or let them mature. Technique: Harvest for fresh shelling when the pods are plump but still green, or let them dry before harvesting, then shell beans and store in a cool dry place. Cooking: Cook green soybeans in the pod in salty water, then shell and eat. Shelled soybeans are stir-fried, used in soups, or stew with beef. Soy sprouts can be eaten when cooked. Technique: Dig the entire taro up. Raw taro is a skin irritant, so wear gloves to protect hands during cooking preparation. Can be cooked with sugar as dessert, served cold or hot. 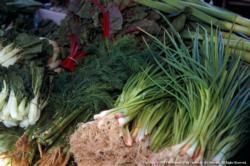 Or add taro to a 'hotpot' with other vegetables, meat, and seafood, a popular dish in winter. Harvest: May be harvested at any stage, from very immature to mature. Technique: Large plants are usually planted about 8 feet apart. Cut fruit from the vine. Cooking: White-fleshed winter melon is usually served as a soup, or steamed with meat. Harvest: When pods reach 12–18" before the seeds fill out the pods. Technique: Beans grow quickly, so harvest daily or every other day. Cooking: In a popular Szechwan dish called dry-fried beans, they are deep-fried, drained and then put in a wok and stir-fried with a bit of ginger. Try them in rolls of marinated beef or pork.